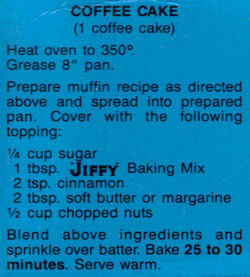 This recipe was clipped from a box of Jiffy Baking Mix, date unknown. Recipe is typed below along with a scanned copy. Combine ingredients. Stir well. Batter will be slightly lumpy. 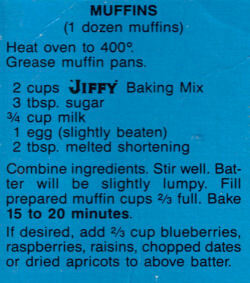 Fill prepared muffin cups 2/3 full. Bake 15 to 20 minutes. If desired, add 2/3 cup blueberries, raspberries, raisins, chopped dates or dried apricots to above batter. Blend above ingredients and sprinkle over batter. Bake 25 to 30 minutes. Serve warm.